I received an email a few months ago about participating in the Leadership Experience. Although I was skeptical about the applicability of military leadership concepts from a Civil War battle in 1863 to business leadership in the 21st century, my interest was piqued. Personally, I wanted to know more about one of the most pivotal battles in U.S. history and professionally I was interested to find out if decisions made by Civil War leaders could be vital to improving my own decision-making ability and leadership skills. I paid the nominal $300 fee covering lodging, materials, and meals, as well as a plane ticket to Harrisburg. To prepare, I read the historical novel Killer Angels depicting the Battle of Gettysburg, which was provided in my tub file from Associate Dean of Leadership Development Ken Keen. Dean Keen also assisted in our preparation by setting up a webinar a week prior to the visit with all of the participants covering everything from recommended attire to trip logistics. On Friday May 20th I immediately recognized a few familiar faces from Goizueta as I get ready to board the plane to Harrisburg along with a few more members of the Goizueta family who I didn’t know. Riding in the shuttle from the airport, I was really able to get a sense of the beauty of the rolling hills of Pennsylvania as I chatted with a Goizueta professor sitting next to me. The weather was absolutely beautiful and we had our fingers crossed that the forecast for 100% chance of rain the next day would not be true. That evening, I met several students from the executive MBA program and we received an engaging briefing from our U.S. Army War College instructor on the events leading up to the Battle of Gettysburg. Waking up the next morning, I held out hope for a sunny and clear day to visit the battlefield, unfortunately it was dreary, raining, and cold! We piled into the charter bus and on the way to the battlefield, our instructor showed us interesting sites like the hotel where Abraham Lincoln stayed when he presented the Gettysburg Address and buildings that still had battle damage. Throughout the day, we made several stops at critical points on the battlefield where we were able to walk onto the actual site. At these points, the instructor discussed situations and decisions by military leaders during the battle and masterfully tied them into relevant concepts for business leaders. Some of the concepts discussed include cognitive bias, shaping the narrative, and setting the strategic vision. He also shared with us examples of other business leaders including Fortune 500 CEOs who had had realizations going through the Gettysburg Leadership Experience. There was rich discussion amongst the group at each stop where participants not only shared their thoughts on decisions made during the battle but how these tied into their professional experiences. These discussions were continued at lunch and dinner and I also had the opportunity to meet and network with many of my professors and classmates from other MBA programs. All in all, this was a great opportunity and I am glad to have taken part. I cannot say enough about the expert teaching ability of the instructor. Even several Goizueta faculty complimented him on his masterful ability. 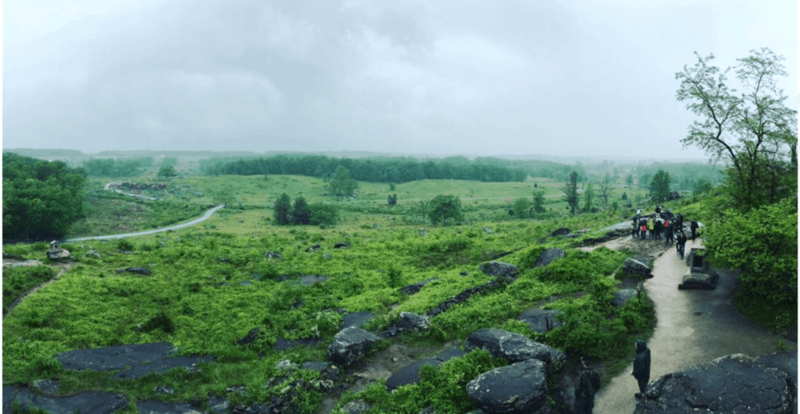 Much of what I learned during the Gettysburg Leadership Experience has next day applicability and I plan to use what I learned in my workplace as a leader of direct reports.